The province of Xinjiang in the west of China is home to the Taklamakan desert. This is one of the largest deserts in the world, and the name apparently means ‘you go in but you don’t come out’. Much of the desert is located in the ‘Tarim Basin’ which is a huge almond shaped depression some 400,000 km2 large. It is so big that you can clearly see it from space. 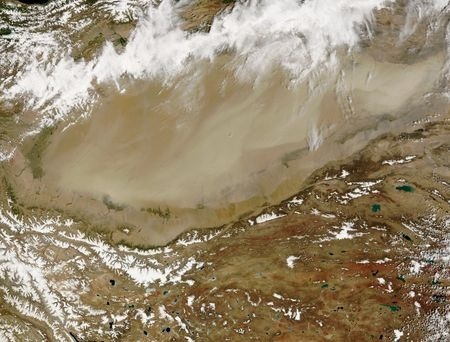 The image below shows the basin from space with a dust storm. As you can appreciate, the climate there is quite harsh with scorching summers where the temperatures reach over 50 centigrade, and cold freezing winters. The early western explorers of the area (Sir Aurel Stein and Sven Hedin) who were searching for antiquities reporting finding dessicated bodies but as they were more interested in artifacts than bodies they did not research them in detail. Had they know the mummies age they would have received more attention, since they dated back to the time of the Egyptians. It was not until the 1980’s that archaeologists began to unearth mummies again, and to date over 100 have been found in varying degrees of preservation. One major difference with Egyptian mummies was that they were not embalmed; they were just dried by the harsh environment – or to be more precise, freeze dried. The most popular theory as to how they were preserved is that bodies buried in the sandy desert froze, or at least got very cold quite quickly, and dried out before they could begin to rot. By the time summer and the high temperatures arrived, the bodies had become mummified. Because they were already dried, the summer’s heat would not cause them to deteriorate. One contributing factor was that that the bodies were placed in bottomless coffins which allowed good air circulation so they could completely dry out. A second factor was the alkaline soil–high in salt–which speeded up the drying out process since the salt sucked moisture from the air and the bodies. I went to the museum in Urumqi with Kurt, the husband of a colleague. I had been told that the best mummies were here and so was grateful to have the opportunity to visit. We hired a very nice young woman guide, who took us through the museum. A new, modern building, it had displays on all the different ethnic groups in Xinjiang, showing their native costumes and various day-to-day tools and other aspects of life. While it was interesting, I was most keen to get upstairs and see the mummies. Unfortunately, photos were not allowed. The two most impresseve are the 4,000-year-old “Beauty of Loulan” and the 3,000-year-old 2 m tall “Yingpan Man”. The Yingpan Man, discovered in 1995 in the region that bears his name, is apparently the best preserved of all the undisturbed mummies that have so far been found. You can see his blond bearded face, his teeth, and even the tatoos that he had on his face. He was found with a gold foil death mask — a Greek tradition — and was wearing elaborate golden embroidered red and maroon garments with seemingly Western European designs. I have bought a book on the mummies by Elizabeth Barber who is a textile expert and argues that the textiles show a common link with the celts who settled in western europe. It was quite strange to be looking at bodies that dated back so far. There was even a young child. The state of preservation was amazing. It raised many questions in my mind, especially about the transient nature of life. How very few of us leave a lasting impact and that while we may have amazing influential lives, they are but fleeting and one day we will all be forgotten. We will not even be like these people, preserved for the future. Of course the question is ‘who were they’ and without a written language we can only guess. Recent DNA testing has confirmed that for first 1,000 years after the Loulan Beauty, the only settlers in the Tarim Basin were Caucasian. About 3,000 years ago East Asian people began to arrive in the east of the Tarim Basin. The Uighur people about 1,200 years ago. This has important political implications. For those who are unfamiliar with China’s politics, there is a separatist movement in Xinjiang province. Some local Uighur people have used the mummies as an argument that Xinjiang should not be part of China. However, modern DNA and ancient DNA show that Uighurs, Kazaks, Krygyzs, the peoples of Central Asia are all mixed Caucasian and East Asian. This entry was posted on Thursday, September 13th, 2007 at 11:20 am and is filed under Uncategorized. You can follow any responses to this entry through the RSS 2.0 feed. You can leave a response, or trackback from your own site.